The theatre complex opened again in 2010 after being totally remodelled. The smaller Swan theatre still remains at the rear of the building, but the main theatre has been removed a new one built inside the original shell. There are extra areas bolted onto each side too, along with a tall tower with views over Stratford. Of course the best thing to do in this complex is watch some Shakespeare and we can thoroughly recommend performances here after seeing Macbeth recently. It was absolutely stunning! Don’t worry if you find Shakespeare difficult to follow, because the acting and the staging really bring the stories to life. 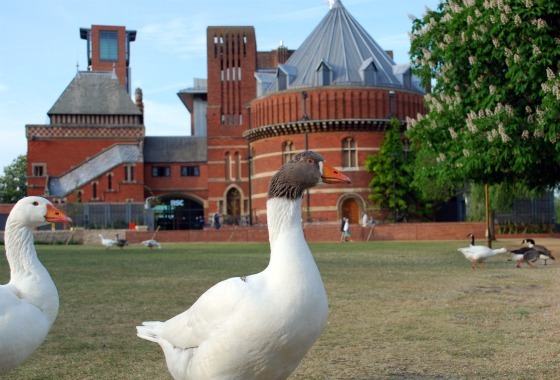 We’ve seen Shakespeare all over the place – but there’s nothing quite like the RSC. Make sure you book well in advance of your trip though, or you may be disappointed. If you haven’t got time to see a play, you can still explore the building. It’s open to the public and with the exception of the tower, it’s free to enter. Inside you’ll find cafes, a restaurant, seating areas, a shop, and the original 1930s art deco foyer. Look out for the old silver box office frontage which is still in place…but can be moved up and down to allow better access to the theatre. This is an extract from our free Shakespeare Country Guide. 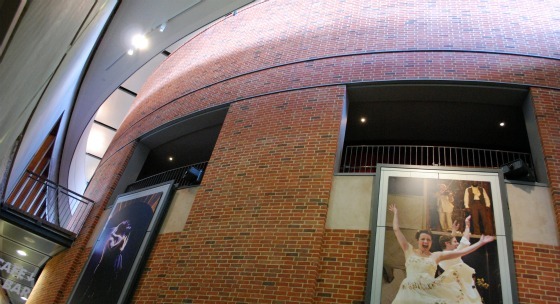 The picture above shows the rear of the RSC theatre complex where you’ll find the only surviving part of the original Victorian building. It was gutted in a fire in 1926. This part of the structure houses the Swan Theatre under the oval shaped roof. To the left of that stands all that is left of an original tower from the Victorian building which was destroyed in the fire. The new tower at the front is a tribute to the old one, which was also open to the public to offer fine views over Stratford upon Avon. 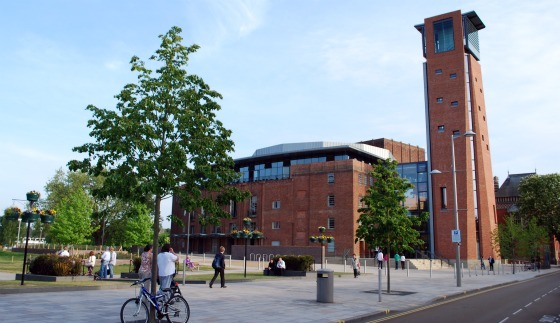 The RSC theatre complex is open from 9am Monday to Saturday and from 10am on Sundays. Admission to the new tower is £2.50 per person, £1.25 for under 18s, £1 per person for RSC Members and £1 for people with disabilities (2011 prices). You can also take an RSC Theatre Tour. Tickets for performances are available from the RSC Ticket website. The theatre complex is located alongside the River Avon in the waterside area of Stratford. Nearby you’ll find Cox’s Yard and the Dirty Duck (Black Swan) Pub.